Barbara Muir Paints: Hey Happy Halloween! Today is my birthday, my second birthday on the blog. the coming year will be even better (hard to imagine!). by my sweet husband, Steven. Yum. from across the country, email cards started coming in. model carrying a pile of wonderful presents. Stop I need to catch my breath. 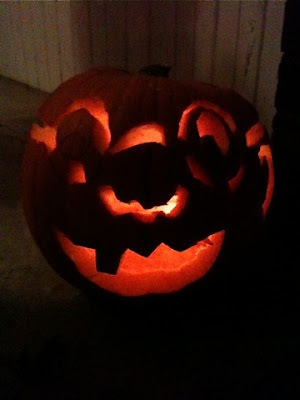 Then we carved the pumpkins. at all and just stand at the door not knowing what to say. and carve one, and Steven cut out my designs on the others. chocolate, presents, and children. And friends. And champagne. Labels: blog 629. pumpkins. Halloween. My birthday. Dear Barbara....all this lovely flow of presents and love shows me what a great gal you are. Wonderful! No wonder you're so magical. Cheers on your special day. It was just super. I do have a full life, not always shining, but I must say I was incredibly happy to be in my life yesterday -- and today too. Thanks for the hugs. Back at you. Thanks so much. I appreciate your good wishes. Happy belated birthday, Barbara!!!!! I wasn't online this weekend and am so sorry I couldn't be one of the first to wish you every good thing and a fantastic coming year. May you continue to fill your life with family, good friends and lots and lots of paint. I think I wrote this blog just a wee bit blitzed on the Veuve Cliquot, my drink of choice if toasting is in order, or even occasion and gaiety. So I probably was more detailed than at all necessary. But it was a fabulous day, and I sure would have loved to talk to you. A great week to you, and I certainly hope to fill my life with family, friends, laughter and paint. Thanks for being a joyous part of my life.